My mom has always loved watching birds at the backyard feeder, and so have I. I know I was very young when she taught me to identify the “snowbirds.” Several years later I learned to more formally identify them as “slate-colored juncos,” and still later yet, “dark-eyed juncos” (hence the need for scientific names). This interesting avian variety is called Junco hyemalis in the world of ornithology. Renowned ornithologist John James Audubon called them snowbirds, so I’ll stick with that. Watching snowbirds scrabble around in the snow for seeds likely dropped by hordes of messy sparrows seems as quintessentially “winter” as Christmas lights and wool hats. Feathered gray above and pale to white below, their plumage seems to exactly match the muted tones of the season. Found from Alaska to the southern Appalachians and all the way into Mexico, snowbirds are estimated to exceed 600 million (1). Most of America is to north-ranging snowbirds what Florida is to many retirees, functioning as winter range for Canadian an Alaskan populations. Millions of snowbirds live in the U.S. throughout the year, however. Although snowbirds are numerous in North America, research has shown a slight decline in recent years, a trend that broadly (and perhaps alarmingly) applies to continental avian species. Their somewhat complicated taxonomy includes at least 5 (and according to some sources, up to 15) described subspecies (1). Their geographical differentiation is a testament to the bird’s adaptability. 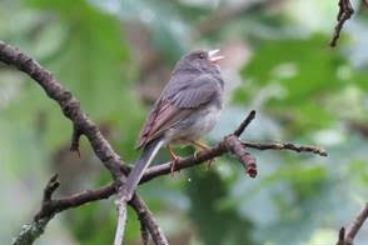 Two particularly striking subspecies are the Oregon junco and the pink-sided junco (see below). All juncos belong to the Passerellidae family (the new-world sparrows). The snowbird’s diet consists of roughly 75% seeds (2), explaining their heavy beaks and fidelity to the backyard feeder. An interesting feeding strategy that snowbirds practice (especially in winter) is to form “foraging flocks,” whose groups are quite conspicuous this time of year. Their frenetic hopping behavior can be quite entertaining, despite their dull color. Even on the stillest and coldest days, their backyard presence is usually a certainty, even if only evidenced by tracks in the snow. Their simple charisma and hardiness are appreciated during winter, reassuring of the resilience of Mother Nature and the promise of Spring. Ryan Reed is an Environmental Education Specialist in the Pennsylvania Department of Conservation and Natural Resources (DCNR) Bureau of Forestry. He possesses degrees in Wildlife and Fisheries Science and Wildlife Technology, while currently pursuing a master’s degree in Environmental Pollution Control. He has also worked for the Pennsylvania Game Commission, and taught high school sciences for 11 years. He is especially interested in biodiversity and ecology. A lifelong hunting and fishing enthusiast, Ryan resides in Harrisburg, PA. This article was originally published in the PA DCNR Bureau of Forestry’s e-newsletter, Forest Fridays.